CLARK COUNTY — We’re past the midway point of August and, believe it or not, Clark County children will soon be going back to school. That is, assuming their teachers are back in the classroom come opening day. In the wake of the Washington Legislature’s move to satisfy the state Supreme Court’s mandate to fully fund basic education, districts across the state have found themselves embroiled in a difficult debate. While lawmakers approved an additional $1 billion ($2.1 billion over two years) to fund raises for teachers and other school staff across the state, they also capped the amount of money districts can receive from local levies. That money has increasingly been used to fund additional pay many teachers receive for work outside of the classroom. That means many district superintendents have argued that the overall additional money they’re receiving from the state isn’t equal to what many teachers unions say they are owed. Teachers in the Battle Ground school district, for instance, have been pushing for a 23 percent increase. The district argues that the local levy cap will cut levy dollars by 44 percent. Teachers in Battle Ground have set a meeting on August 23 to discuss what their next steps will be if salary negotiations don’t move forward. That could include potentially setting a date for a strike vote. That meeting is just one of several set for teachers across the county, as the new school year approaches. 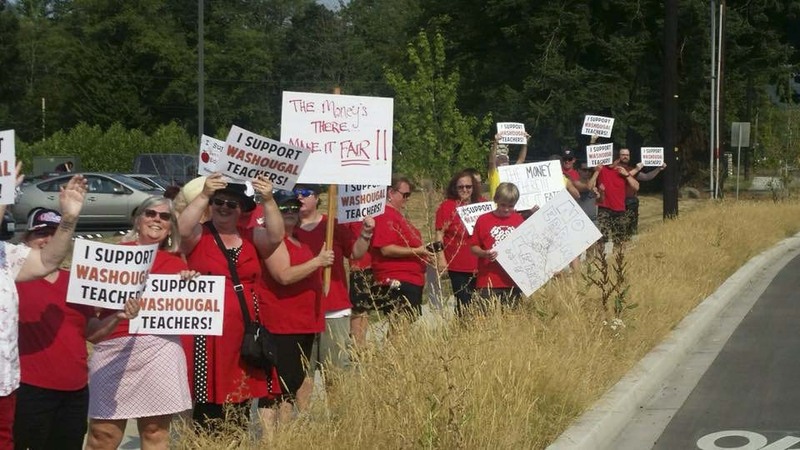 Thursday afternoon, the Evergreen School District proposed an 8.33 percent pay raise for its 1,800 teachers for the coming school year. That would boost pay for a starting teacher to $50,687, while the most experienced teachers would receive $96,045. The district says that would make the average teacher pay at Evergreen schools $79,000 a year, plus full benefits. That would likely keep Evergreen teachers among the highest paid in Southwest Washington. ClarkCountyToday.com has reached out to the Evergreen Education Association for comment on the proposal but have not yet heard back. In Woodland, where teachers have two years remaining on their contract, teachers are expected to approve a 22.82 percent raise on Friday. That would boost starting pay to $46,600 next year and $48,676 the following year. Top pay for more experienced teachers would move to $87,832 next year, and $91,746 in the final year of the contract. Teachers will still be able to earn extra income through Time, Resources, and Incentive (TRI) pay. Many districts will also continue to pay a yearly stipend for teachers to buy materials for students out of their own pockets. 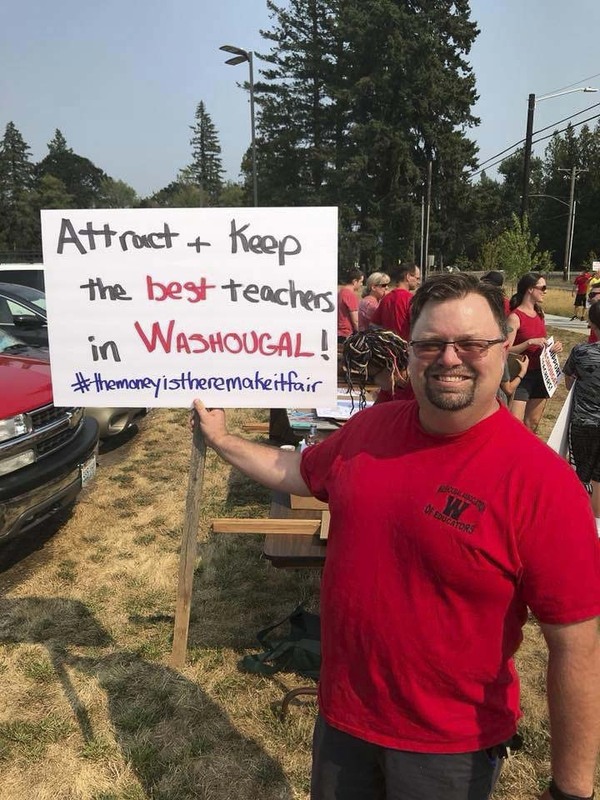 In Washougal, where teachers will meet on August 20, WAE President Eric Engebretson says their formula shows teachers should be getting a 26 percent raise. He says the district’s current offer is for 15 percent, which is a significant improvement on earlier offers that union officials claimed would have seen some teachers actually taking a pay cut. Engebretson says the district there is looking to eliminate TRI pay as part of any deal. It seems clear from where most districts are at now in terms of negotiations, that most local teachers can likely expect a double-digit percentage pay increase next year. It will likely end up being less than many thought they’d get when the legislature approved their education funding, but more than many districts said they could afford just about a month ago. ClarkCountyToday.com will continue to follow the negotiations as they develop.